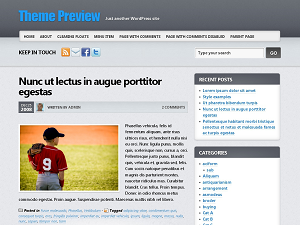 This time I’d like to introduce you a WordPress Themes that very popular in WordPress.org. It called Evolve, made by theme4press. Actually EvoLve is one of a premium WordPress theme in theme4press with advanced features including lots of options. It features a modern design with up to 14 color variants, fully customizable layout, post excerpts with thumbnails, custom Menus support and other cool features. With all of those features I think it is more than just enough for you to make your own creation for this themes. It’s a GPL license, so it’s free for you to use and make some modification if you want to. You may Download this Evolve and preview this themes from the official themes. Evolve already translated in Spanish, German, Swedish, Dutch, French, Russian, Turkish. Tested with WP 3.1 and major browsers – Mozilla Firefox, Internet Explorer, Opera and Chrome. We can manage the features using our own mother tongue. Just for your knowledge, a themes with many features needs to study more and takes time to handle it suppose become a nice blog you want to. But if only to look a simple and clean style, I think you might not need this themes, but if you want to try this, that would be fine. Have a nice try. wow what a cool themes. Thanks for the heads up on the EvoLve theme…I usually use thesis for all my wordpress sites. But I think it makes sense to vary your themes so I will for sure take a look. That’s a nice looking theme…I wonder if it can be easily modified for a product comparison site?